An evening of Hindustani music with Vocal, Santoor, Sitar and Flute accompanied by Tabla & Harmonium by resident Guruji’s of S S Vidwan Memorial School of Indian Classical Music based in Hubli, which will premiere its first international concert at The Bhavan, London followed by subsequent shows in Milton Keynes, Basingstoke, Manchester and Edinburgh from 11thMay 2019 to 26th May 2019. Hubli-Dharwad and its surroundings bring out so many musicians. The Dharwad Gharana – Hindustani classical music’s southern home. Karnataka – a state in India that has successfully been a home to both Hindustani and Carnatic genres of music. Similarly S S Vidwan Memorial School of Indian Classical Music is continuing the legacy of nurturing both North and South Indian Classical Music. Pt Sacchidanand Desai,comes of a family of talented performers of Hindustani Sangeet. 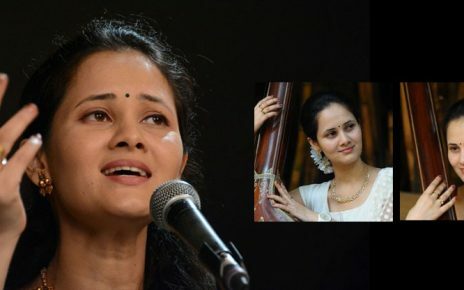 An outstanding Hindustani vocalist with career span of three decades. While his forte is Khayal, he is equally adept at lighter forms of hindustani classical musicincluding regional “Dasa & Vachana Sahitya Gayana”. A dedicated teacher, devotes himself to teachingstudents of all age-group. Due to his great rendering of “aruna raga (morning tune)”, popularly known as Pt Arun Desai Guruji. Pt Keshav Malvi is a Santoor & Sitar player.Born into an exceptional Musician-lineage, was introduced to music at the age of four years. He has received training and guidance from santoor maestro Pt Shivakumar Sharma. An ‘A’ grade artist of the Indian radio and television network. His improvisation on the shape and string arrangements produces a deep soulful classical music which touches the soul – be it of a connoisseur or that of a common man! Shri Harish Kulkarni, a Flautist and prolific performer. He has received his training from renowned Flautist in Kirana & Gwalior Gharana styles. He has deeply spiritual approach to music and life. He has an engaging style and is able to reach out and communicate with audiences of all backgrounds. His style is characterized by scintillating fast taans, mastery of the meditative alaap, and brilliant fluency of melody (raaga-bhava), while remaining true to tradition. He has been imparting intensive training to several young aspirants grooming them into performers and teachers. Shri Shrihari Diggavi, is a brilliant and highly regarded Tabla player.He has conceived and participated in various musical collaborations and accompanied the leading musicians of Karnataka & Maharashtra. He performs regularly in concerts and is the recipient of several prizes and awards including the Young Performing Artist. Shri Krishna Patil, a versatile harmonium player. Over his illustrious career spanning four decades, he has performed in a number of prestigious concerts, festivals and events in India and accompanied the greatest of artists. We request everyone from the community to please plan to attend and support this unique tour from the eminent artists and spread the word to your friends in wider Indian Community. Due to some clashes with dates and artists availability Rajyotsava program has been rescheduled to 30th Nov 2013. Sorry for any inconvenience. Program exact details will soon be published. Thanks KannadigaruUK Team.